Bonded Laminated Aluminum Tape to Dialectric Foam, 60% Braid, Laminated Aluminum Tape, 40% Braid Outer Shield, encased in a Flame Retardant PVC Jacket. Note: SuperShield (Quad Shield) - Taking the Tri-Shield construction one step further, this construction adds an additional layer of shielding braid to provide the greatest strength, durability and immunity from network interference. Provides low attenuations for service drops greater than 150 feet in length. Quad Shield Provides Maximum Shielding Integrity in a Pliable Coaxial Drop Package. This is the same Commercial Grade Low Loss Cable your local Cable TV company uses to get from the Telephone Pole to your House. Our Customers use this in their MHP Hotel Motel SMATV Cable TV, Video Surveillance and Hi Speed Internet Systems to distribute around Larger Properties. With Flexible Braided Shield Cables, Quad Shield offers the Maximum amount of Shielding Integrity in comparison to Single, Dual or Triple Shields. 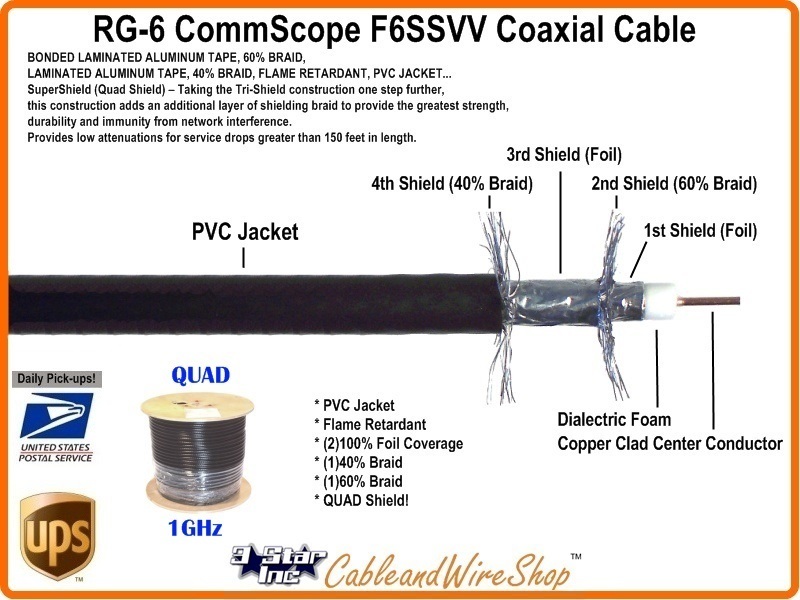 Quad Shield RG6 would denote alternating Aluminum Foil and Aluminum Braided Shield Layers, starting with the Bonded Foil Layer around the Foam Dialectric (which encases and supports the Center Conductor), with the better Quad Shield having 2 Layers of Braided Aluminum Shield, one of 60% and the 2nd at 40%. The Physicality of the Density of the Braid and Foil is truly a formidable Barrier to Ingress and Egress of Signals, but is only half of the equation. To sink ambient signals that are attracted to the shield, a connection to a good Ground is a must, long Drops should have such a connection at both ends.